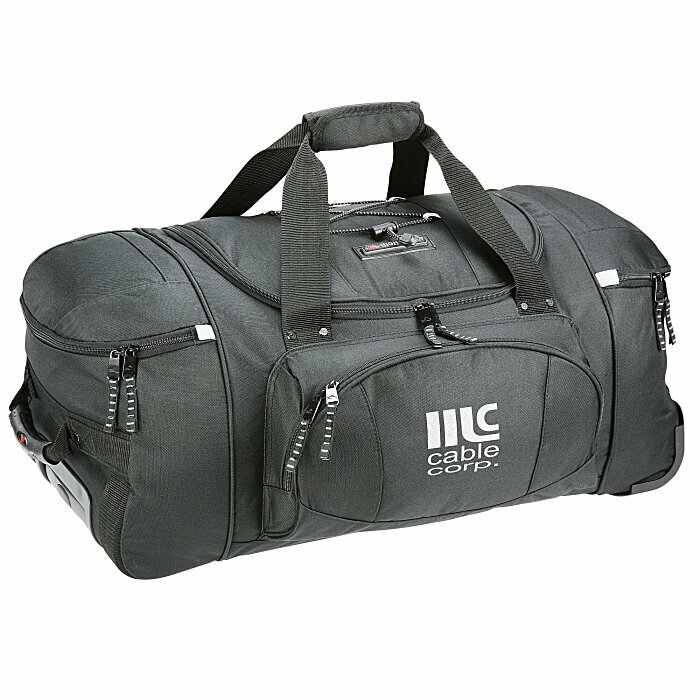 Give your promotion wheels with this duffel bag! Large main compartment with U-shaped zippered opening will hold all their travel essentials. Features include zippered front accessory pocket and two top-loading end compartments. Inline skate wheels have corner protectors. Extendable, locking telescoping handle provides easier transportation of well-packed bag. Cord-locked bungee cord on top of the bag keeps stored items easily accessible. Size: 13" x 26" x 12". Your price includes a one-color imprint on the front pocket of the bag. Additional imprint color/locations available for an extra charge. Set-up charge: add $60 per color.